Surprise, surprise, a Catriona Shearer puzzle. 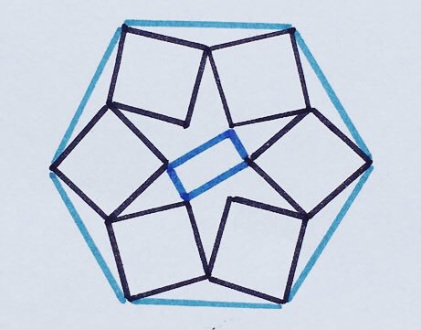 Six identical squares and a smaller rectangle are fitted into this regular hexagon. What fraction of the hexagon do they cover? Is there any way to do this besides the hard way? I looked for a dissection solution but came up with nothing. and are two sides of a square. and are two line segments I added. The central rectangle isn’t shown here because it differs in the different triangles around the hexagon. Then the height of the triangle is and its area is , and the hexagon’s full area is . The sides of the squares are , so the six squares have area . The central rectangle has area . Then the squares plus rectangle are , which is of the hexagon’s area.